The EKCO EV80M implements our signature valve amplification techniques into a mono power amp, for a beautifully intricate performance in its purest form. Using a combination of 1 x 6SN7GT, 2 x6SL7GT and 2 x KT120 valves, users can toggle negative feedback operation, triode / ultra-linear modes and speaker A/B outputs, proving an adaptable amp for different speakers, sound sources and musical tastes. The EKCO EV80M lets its listener choose between the channels Triode mode (50 Watts RMS) and Ultra-linear mode (80 Watts RMS). 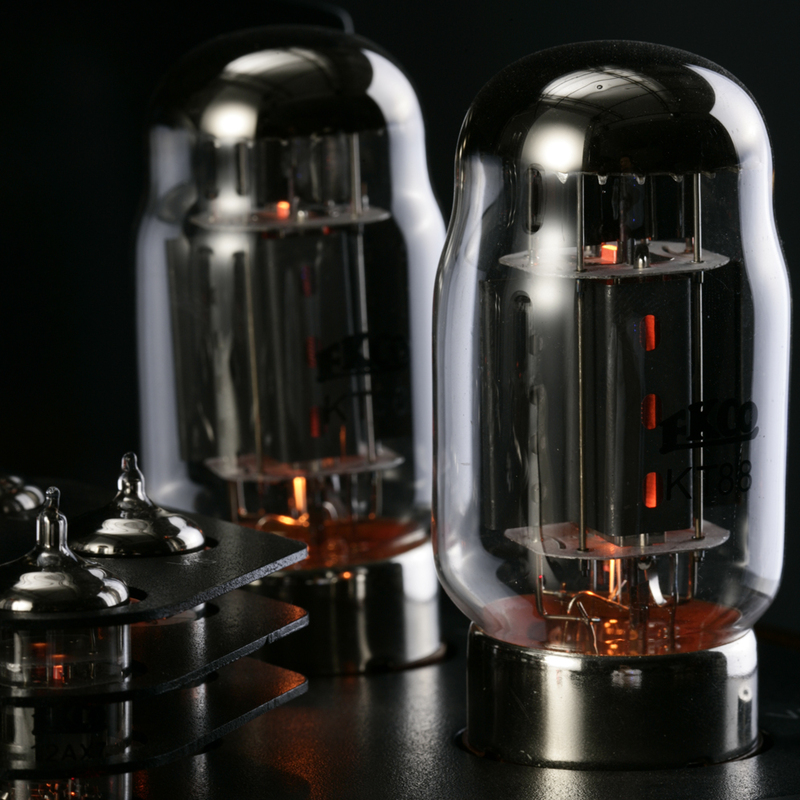 The triode push-pull output stage is the choice for many audiophiles for its detailed and pure sound quality. Triodes are delicate valves which have limited output, so for driving higher powered speakers Ultra Linear mode is ideal. By connecting the screen grid to a special tapping on the output transformer a local feedback loop is incorporated around the output valves, lowering their output impedance, linearising the output and massively reducing distortion. The result is an amplifier with most of the advantages of the triode combined with the efficiency and power of a multi-grid valve. The EV80M is equipped with an Overall Negative Feedback (NFB) switch. This is a process where a percentage of the output of an amplifier is fed back to the input in reverse (negative) phase. This lowers the output impedance and reduces distortion to improve overall frequency response. As NFB at high frequencies can cause instability at high frequencies with awkward loudspeakers we recommend with horn loudspeakers that triode operation with low NFB is the way to go, however with conventional, low sensitivity loudspeakers Ultra linear mode with high NFB would be a suitable choice. Either way, we've made the EV80M as flexible as possible to cater for different speakers, sound sources and tastes. The EV80M's steel chassis is sandwiched in between matched, handcrafted solid wood panels (Deep Louro Petro) in piano gloss finish. It's design influenced by Ekco's original bakerlite FM radios with a modern twist to match the most stylish of living rooms.